In the recent report on the state of LTE networks in the United States, Tutela demonstrated that Verizon has the lead over its competitors in average download speed and consistent quality. By all indications in the report, Verizon’s network is the best; whilst that’s thanks to dozens of factors, a close examination of Verizon’s spectrum holdings and utilization sheds some light on how Verizon consistently delivers a stable connection to its subscribers. 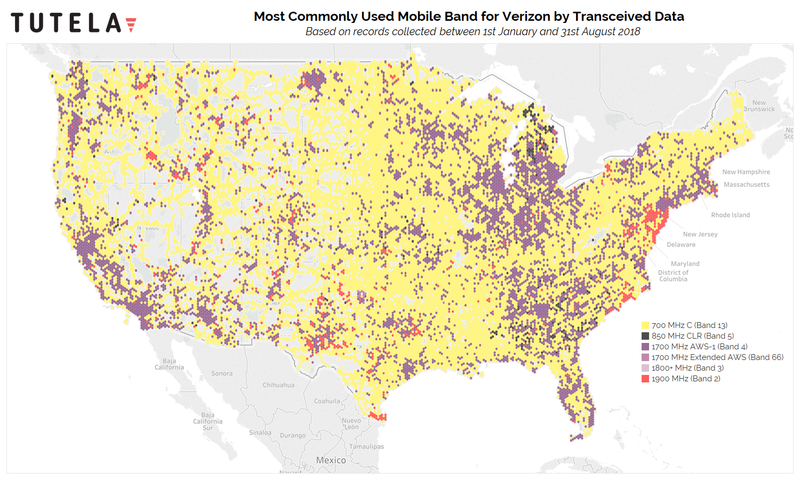 The map above shows the most commonly-used mobile band by Verizon customers, extrapolated from Tutela’s dataset of hundreds of millions of tests nationwide. The map paints a vivid picture of Verizon’s network infrastructure. Underpinning the national network is Verizon’s 700 MHz spectrum, known as LTE Band 13. Until the US started its ongoing migration of analog TV off the 600 MHz frequency, Verizon’s 700 MHz spectrum was some of the lowest-frequency spectrum used for cellular networks in the country. Low-band spectrum makes for a good backbone spectrum for a network thanks to its propagation characteristics. The lower the frequency of a radio wave, the further it can practically travel, and the less it is affected by objects in its path. In the real world, that means low-band cell signals travel further and deal with obstacles such as trees, buildings, and hills much better than their mid-band and high-band counterparts. All of that means low-band spectrum is ideal for covering rural and suburban areas, as the same square footage can be covered with fewer cell towers than would be needed to cover the same area with mid-band or high-band spectrum. But the same characteristics that make low-band spectrum ideal for rural areas cause limitations for urban deployments. In cities, capacity -- not coverage -- tends to be the limiting factor, thanks to the radically higher population density. To increase capacity, network operators have to add more LTE channels and more cell sites, a use-case that mid-band spectrum like the 1700 MHz AWS band is ideally suited for. This shows up on our spectrum map clearly: the majority of the US is blanketed in an “underlying” coverage network of 700 MHz, which ensures that Verizon customers can get a signal most places they go. In urban areas with thousands of users all wanting to use a device simultaneously, Verizon adds cell sites that use its mid-band 1700 MHz and 1900 MHz spectrum, thus the purple and red dots surrounding major population centers. The divide is pronounced when you split up the US into urban and non-urban areas. 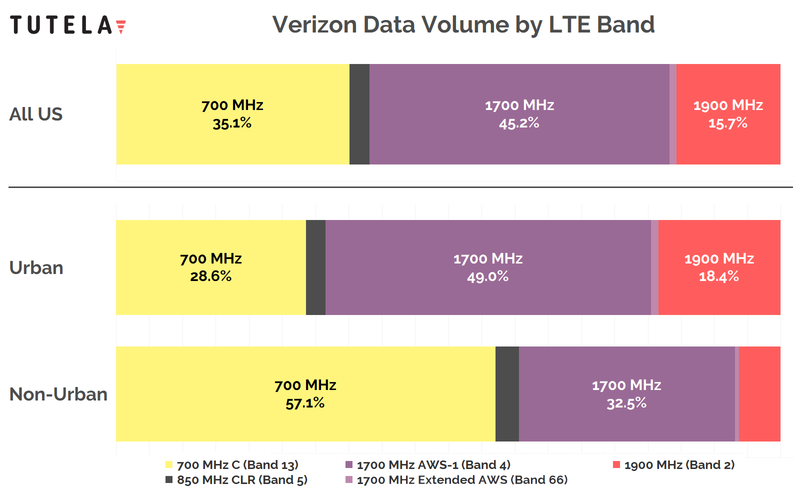 Outside of cities, the low-band 700 MHz and 850 MHz spectrum accounts for over 60% of data transmitted and received by Verizon customers; in urban areas, that number is barely 30%, and 1700-1900 MHz spectrum accounts for over 70% of data traffic. Verizon’s diverse spectrum holdings, combined with its investment in actually building out the spectrum, help account for the company’s nation-leading consistent quality score, but the network is also going to have to prepare for the future. With the advent of 5G and a possible shift to home internet connections served over a wireless network -- a service Verizon recently made commercially available in some markets -- the total volume of data traffic sent over wireless networks is set to increase precipitously. Despite improvements in wireless network technology, the maximum theoretical capacity of a single spectrum band is intrinsically limited according to a widely-accepted mathematical principle. In order to cope with an explosion in demand for wireless data, network operators will have to look to increasingly higher-band spectrum for the extra capacity. Verizon already owns 53% of the 28 GHz spectrum licenses for the US, and 40% of the 39 GHz licenses. Depending who wins the Federal Communications Commission’s current high-band spectrum auction (which Verizon is participating in), those numbers may grow. As networks begin the transition to 5G, the benefits of a diverse spectrum portfolio will only grow. High-band spectrum will be critical to achieve the speeds and capacity that 5G promises, but maintaining a consistent quality and coverage will also involve low-band and mid-band spectrum. Verizon is currently well positioned with spectrum licenses to make the shift to 5G; provided the operator continues to invest in its wireless infrastructure and spectrum holdings, its customers should continue to reap the benefits. Discover more of our data insights for the United States, and across the world, by joining Tutela Insights today.